This is a facial, deep cleansing product in the Procter and Gamble family. It not only cleans and moisturizes the face, but also treats topical acne and blemishes. Its traditional signature cobalt blue jar has been used by consumers since 1914 when it was first sold as “Townsend R22” in Ocean City, Maryland as a sunburn remedy. Its creator, Dr. Townsend, had combined eucalyptus, soybean, linseed oil, and camphor menthol, to soothe the sunburns of local tourists. 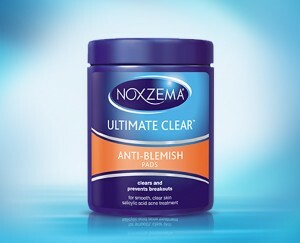 One customer mentioned it also “knocked my eczma” and NOXEMA was born. It was produced by Unilever originally, but AlbertoCulver took them over in 2008, and P&G absorbed AlbertoCulver. Noxema has always claimed to provide not only deep cleaning of the face, but also, the added moisturizing aspects, as well as oil control. The claim that is has been “dermatologist tested” adds to the credence that this cleanser will also help with facial problems such as blemishes and topical acne. This is accomplished because it has surfactants that make the facial oils soluble and lifts dirt from deep in the face’s pores. Currently, the product line offers both the original cream in a plastic jar (the Classic Clean items), as well as in a pump container, along with Ultimate Clear items such as blemish pads, oil control cloths, scrubs, and acne medication. Recently, there has also been shaving creams and disposable shavers added, featuring the signature “tingling” clean sensation produced by the product. There was a men’s shaving cream introduced in the late 1960s which, in the TV and print commercials, encouraged men to “Take it off, take it all off” (referencing their facial hair) with sultry models.